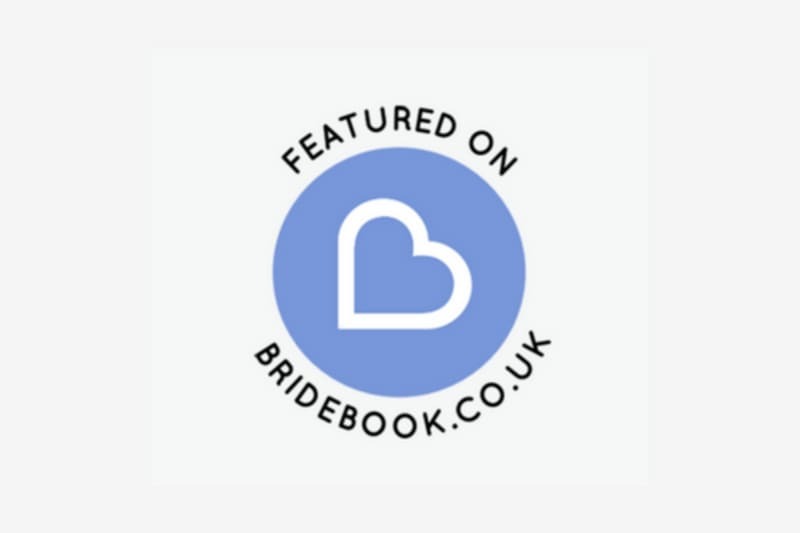 Bridebook Business’ aim is simple: we want to make sure that your Business profile is seen and matched with as many of our happy couples as possible. Our Venue and Supplier search is one of the fastest growing Bridebook features; in fact, we’ve seen an increase of 700% in searches since the start of this year! So to ensure that we can continue to provide an industry leading wedding supplier search function it’s imperative that we continue to innovate and enhance our systems. The Bridebook team have been working on 6 Business Account updates that will improve your SEO, help you increase and manage enquiries, and simply benefit your business all round. 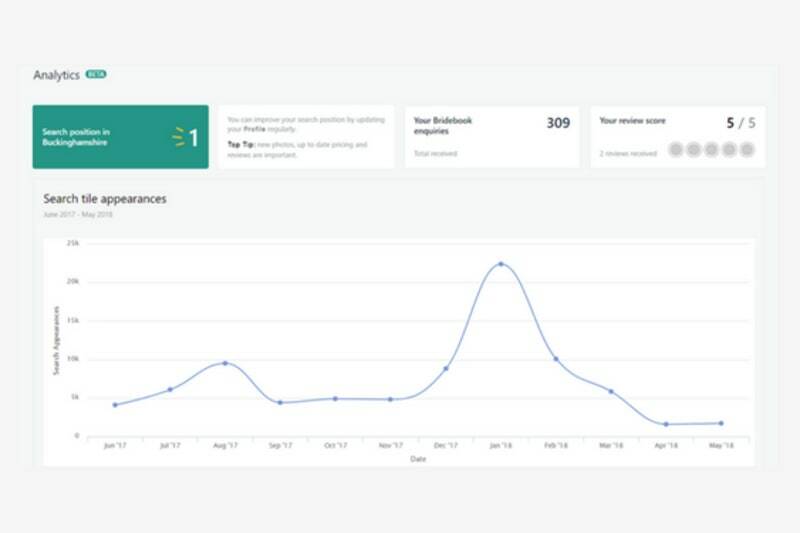 Bridebook is launching bespoke analytics dashboards for registered wedding venues to ensure that the benefits of having a Bridebook Business profile are fully realised. Monthly search appearances – identify peaks and troughs in the couple engagement lifecycle and see how adding information to your profile affects appearances month on month. If these dashboards are as successful as we expect they’ll be, we’ll roll them out to all registered UK wedding suppliers. 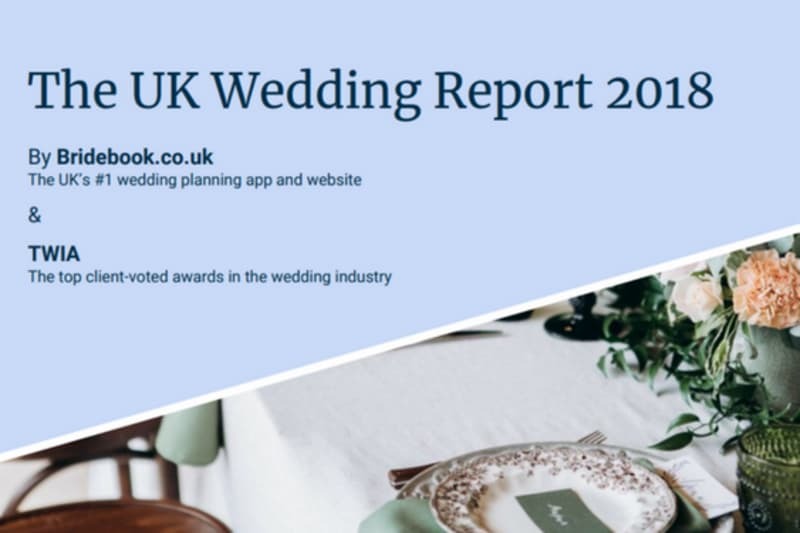 All wedding suppliers registered with Bridebook will now gain access to Wedding Industry Reports; providing the most comprehensive insights into the planning behaviours and spending patterns of couples today. This free data is essential in helping all UK wedding suppliers strategise in line with what the wedding market of today expects from us. 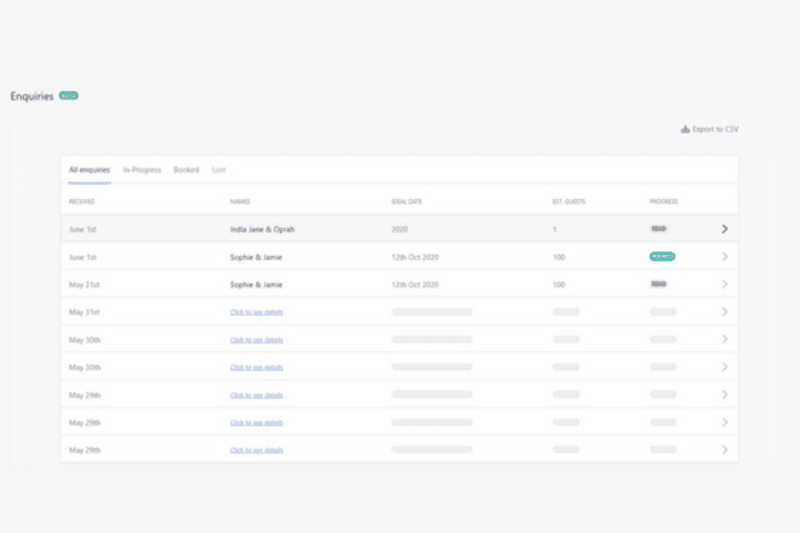 Bridebook is excited to introduce Enquiries Manager – one easy to use, organised portal that enables you to manage and track your enquiries in the simplest of ways. Check out this Enquiries Manager article and video for a full explanation and tour of the system. You can now promote your wedding fairs, open days and events for free with Bridebook. Simply login to your Bridebook Business account, select ‘Fairs & Network’ and add your next upcoming event. Once added, your event details will instantly appear on your Bridebook profile and we will share your event with our social community of over 250K followers – no catch; it’s all completely free. Bridebook has launched 3 types of digital badges that can be personalised to your business and which link directly to your Bridebook profile. This means that you can instantly build your industry reputation by adding your personalised Bridebook.co.uk badge to your website or email signature to showcase your profile to potential couples and fellow suppliers. Simply head to business.bridebook.co.uk, login to your account and select ‘Profile Settings and badges’. A simple but fab development is the ability for all wedding suppliers to now set up multiple login emails for one profile/account and multiple profiles under one login account. 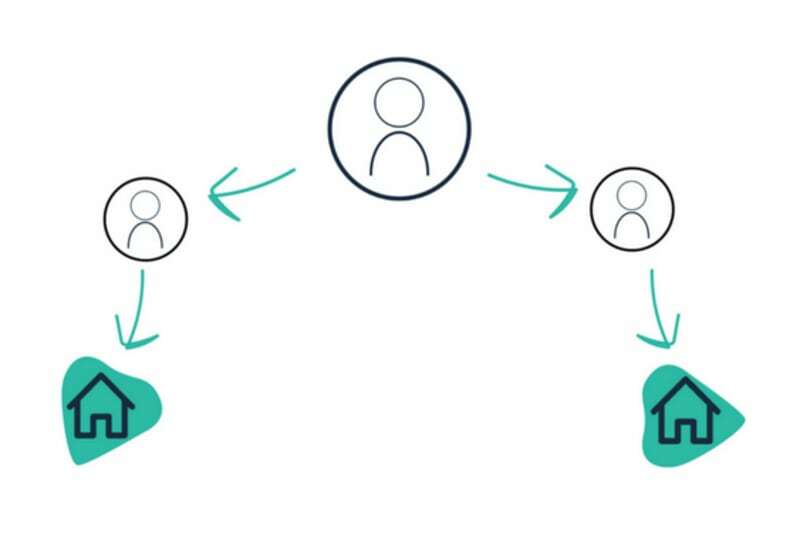 This saves you and your team from having to share one set of login details and enables each member of your team to make their own updates under their own profile. To update your Bridebook Business profile, log in to your Business Account HERE. Once updated, you will instantly increase your profile searchability and you will be able to connect with our community of 100,000 couples. It’s so important that you spend a little time each week adding all the photos, videos and information you love about your business – don’t miss out on enquiries and bookings by not selling your services well enough. Looking for more tips and tricks on how to grow and market your business? Like the Bridebook Business Facebook Page and receive weekly updates from industry experts and thought leaders across the UK. For any questions about your Bridebook Business or your free wedding business account on business.bridebook.co.uk, email our friendly supplier success team at business@bridebook.co.uk who always want to hear from you. We look forward to helping make 2018 / 2019 a successful year for your wedding business! 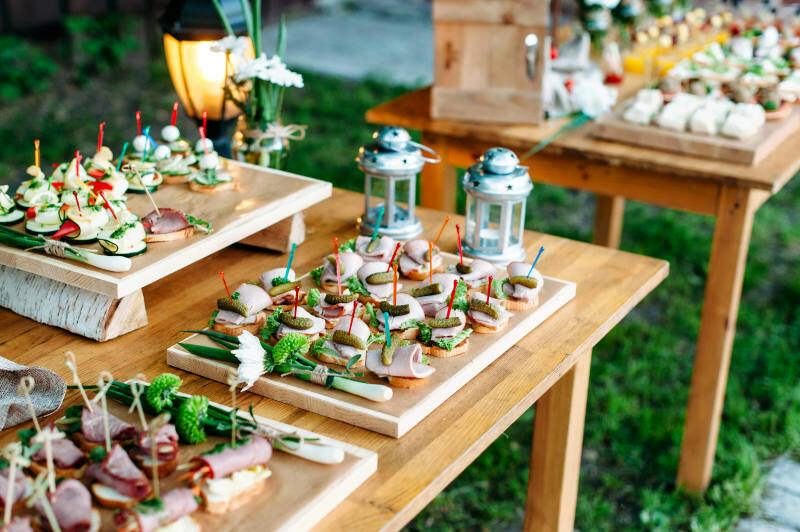 Looking for more wedding industry supplier stories and couple insights? Head to the Bridebook Business Hub, the home of wedding industry knowledge.